Five Years on from the 2009 Gas Dispute: Are Russia and Ukraine any Closer to a Stable Arrangement? Another winter is upon us, and once again, observers are left shaking their heads as another potential Russia-Ukraine gas dispute appears to have been narrowly averted. As we approach the fifth anniversary of the much-publicised Russia-Ukraine gas dispute of January 2009, it is time to take stock and ask ourselves; what can we learn from developments over the past five years? Can we identify any trends that will shape developments over the next five years? This article begins with an overview of the January 2009 dispute and its legacy, before examining the developments of the last five years in Russia-Ukraine gas relations. The events of the last three months are then considered separately, before conclusions are drawn about what we might expect from Russia-Ukraine gas relations over the next five years. In December 2008, across swathes of Europe, snow covered the ground and temperatures remained stubbornly below freezing. As people across the continent celebrated Christmas and prepared for New Year’s Eve, gas supply negotiations between Russia’s monopoly gas exporter, Gazprom, and Ukraine’s wholesale gas importer, Naftogaz, reached a frantic climax, with no little help from their respective governments. Despite months of negotiations, the two sides had failed to conclude a new contract for the supply of Russian gas to Ukraine. These developments were critical for European energy security. In 2008, Russia had supplied the European Union with 144 bcm of natural gas (Gazprom, 2013), 38 percent of EU gas imports and 23 percent of total EU gas consumption (Eurostat, 2013). However, this dependence on Russian gas supplies was not evenly spread: While western European states were less dependent on Russia than the EU average, Central and Eastern Europe was particularly vulnerable. Bulgaria, Estonia, Finland, Latvia, Lithuania, Slovakia, and non-EU member Serbia relied on Russia for 100 percent of their gas imports. Austria, Czech Republic, Greece, Hungary, Poland, and non-EU member Croatia all relied on Russia for at least 70 percent of their gas imports (BP, 2009: 30). That same year, Ukraine transited 117 bcm of Russian gas to Europe (Naftogaz, 21013). Transit via Ukraine therefore accounted for 81 percent of Russia’s gas exports to the EU, and all of Russia’s gas exports to Austria, the Czech Republic, Slovakia, Serbia, Croatia, Bulgaria, Romania, and Greece (Entsog, 2013). Ukraine itself was Russia’s largest single export customer, importing 52 bcm of Russian gas in 2008, with those imports accounting for more than three-quarters of Ukraine’s 67 bcm annual consumption (IEA, 2012: II.9, II.17). Transit via Ukraine accounted for 81 percent of Russia’s gas exports to the EU, and all of Russia’s gas exports to Austria, the Czech Republic, Slovakia, Serbia, Croatia, Bulgaria, Romania, and Greece. At midnight on the 31st of December 2008, Gazprom’s gas supply contract with Naftogaz expired. The following morning, Gazprom shut down gas deliveries to Ukraine, but continued to pump gas into the system for delivery to Europe. However, European importers began reporting reduced delivery volumes. Gazprom accused Naftogaz of stealing the gas, while Naftogaz accused Gazprom of reducing the input volume and failing to provide enough gas to maintain sufficient pressure in the pipeline system. On the 7th of January, Russian gas supplies to Europe via Ukraine stopped completely. They remained suspended for the next two weeks. Finally, on the 19th of January, the heads of Gazprom and Naftogaz, in the presence of the Russian Prime Minister, Vladimir Putin, and the Ukrainian Prime Minister, Yulia Timoshenko, signed a new 10-year gas supply and transit contract. The following day, gas supplies to, and via, Ukraine were restored. Naftogaz committed itself to purchasing 40 bcm of gas in 2009 and 52 bcm of gas every year for the remainder of the contract, with an 80 percent take-or-pay provision giving a minimum purchase of 42 bcm. Given that Ukraine’s gas imports in 2008 were exactly 52 bcm, this meant unless Ukraine’s gas consumption rose or gas production fell dramatically, virtually all of Ukraine’s gas imports would be sourced from Russia for the next decade. Crucially, Naftogaz agreed to pay oil-indexed ‘European’ prices, which, according to Pirani, Stern, and Yafimava, (2009: 26) appeared to be ‘netted back’ from a European border price of $495 per thousand cubic metres. Just over a year later, in April 2010, the new Ukrainian President, Viktor Yanukovych, held a meeting with his Russian counterpart, Dmitrii Medvedev, and representatives of Gazprom and Naftogaz, in the city of Kharkiv, Eastern Ukraine. Yanukovych had been president for a month, having beaten the former prime minister, and ‘Orange’ candidate, Yulia Tymoshenko, in a recent presidential election. 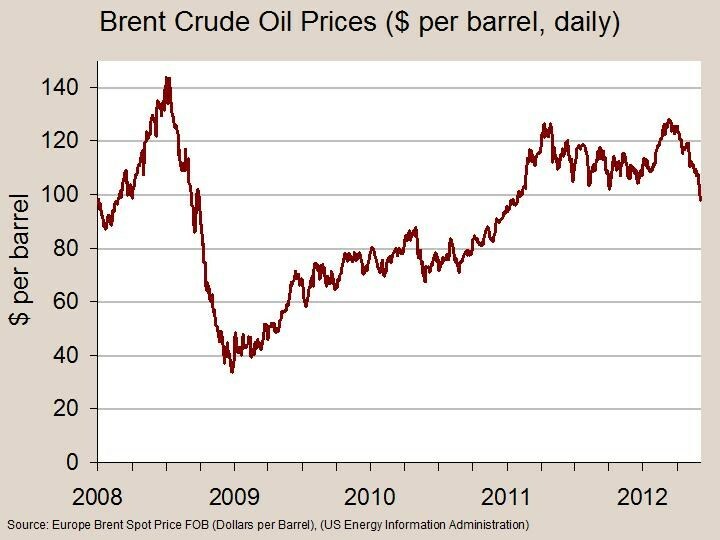 Over the previous year, oil prices had rebounded from their nadir of $40 a barrel in December 2008 to $84 a barrel in April 2010 (Energy Information Administration [EIA], 2013 – See graph), dragging oil-indexed gas prices upwards with them. This led to vociferous complaints from the Ukrainian government that it had been forced to sign a patently unfair contract, and repeated requests for gas price discounts. The election of Yanukovych prompted a thaw in Russia-Ukraine relations, opening up the possibility of renegotiating at least some aspects of the contract. At the meeting, the participants signed the ‘Kharkiv Accords’ (also known as the ‘Gas-for-Fleet’ deal). In exchange for extending the lease on the Sevastopol naval base to Russia’s Black Sea Fleet, the Russian government agreed to suspend customs duties on gas exports to Ukraine up to the value of $100 per thousand cubic metres, with the discount passed on to Naftogaz. The ‘carrot’ of this offer [to transfer ownership to Gazprom] was backed by the ‘stick’ of the threat to reduce gas transit via Ukraine to nothing, rendering the GTS worthless. The next two years were characterised by several attempts by Gazprom to gain control over Ukraine’s Gas Transportation System (GTS), in a bid to increase the security of gas transit via Ukraine. Gazprom offered further gas price discounts and investment for upgrading the system. The ‘carrot’ of this offer was backed by the ‘stick’ of the threat to reduce gas transit via Ukraine to nothing, rendering the GTS worthless. Such a reduction in Ukrainian gas transit would be achieved by the construction of two new export pipelines for the delivery of Russian gas to Europe that would bypass Ukraine: Nord Stream and South Stream. The proposed combined capacity of Nord Stream (55 bcm) and South Stream (63 bcm) would be 118 bcm – just above the amount of Russian gas transited via Ukraine in 2008 – a coincidence not lost on many observers, especially in Ukraine. Nord Stream, which delivers gas directly from Vyborg (Russia) to Greifswald (Germany) under the Baltic Sea (see map), was constructed between April 2010 and October 2012 (Nord Stream AG, 2013). However, the construction of Nord Stream failed to convince the Ukrainian government to give up control over the country’s GTS, and they rejected Russian proposals for a joint venture to manage the system. Gazprom then tried to pressure the Ukrainian government with plans for South Stream that would circumvent Ukraine with gas deliveries to South-East Europe under the Black Sea through Turkish territorial waters (see map of route), but to no avail. Finally, in the last three months of 2012, final investment decisions were taken for the Serbian, Hungarian, Slovenian, Bulgarian, and offshore (Black Sea) sections of South Stream, while Gazprom also symbolically began construction of the onshore Russian section of the pipeline (South Stream Transport AG, 2013). From 2010 onwards, the Russian government also repeatedly promised gas price discounts if Ukraine joined the Russian-led Customs Union of Russia, Belarus, and Kazakhstan, which came into force in July 2010 (Radio Free Europe/Radio Liberty [RFE/RL], 2010). Again, the Ukrainian government rejected Russia’s advances, preferring to initial an Association Agreement with the EU in March 2012 and a Deep and Comprehensive Free Trade Agreement (DCFTA) in July 2012, with the initialling of such documents a precursor to their formal signature and application (European Union External Action Service, 2012). In H1 2013 Ukraine had fallen to the fifth-largest importer of Russian gas, behind Germany, Italy, Turkey, and Belarus. Whilst Gazprom was building pipelines and the Russian government was pressing for closer relations with Ukraine, the Ukrainian government was actively seeking to reduce its dependence on Russian gas imports. This would be achieved by a combination of reduced gas consumption, short-term increased coal consumption, a medium-term diversification of gas imports, and a long-term increase in domestic gas production. Ukrainian gas consumption fell from 60-67 bcm in 2008 to 47-50 bcm in 2009, rose again to 52-56 bcm and 54-56 bcm in 2010 and 2011 respectively, before falling again to 50 bcm in 2012 (BP, 2013: 23; IEA, 2012: II.9). This reduction was achieved partly due to increased coal consumption, which grew by almost a third during this period, from 35.1 million tonnes of oil equivalent (mtoe) in 2009 to 44.6 mtoe in 2012 (BP, 2013: 33), as domestic coal replaced imported gas in Ukraine’s power stations. 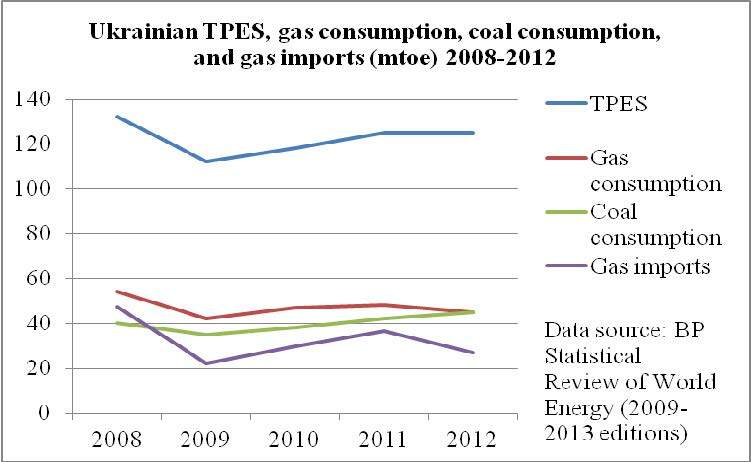 However, the impact of economic recession in 2009-10 on Ukraine’s industrial output and total primary energy supply (TPES) cannot be ignored: Total primary energy consumption in Ukraine fell from 132 mtoe in 2008 to 112 mtoe in 2009, and recovered to 125 mtoe in 2011 and 2012 (BP, 2013: 40). Between 2008 and 2012, the share of natural gas in Ukraine’s TPES fell from 40 percent to 36 percent, while the share of coal rose from 30 percent to 36 percent (BP, 2010: 41). Ukraine’s reduced gas consumption had a significant impact on Ukraine’s gas import volumes. In 2008, Ukraine was the world’s largest importer of Russian gas, with Naftogaz importing 52 bcm from Gazprom (IEA, 2012: II.17). By 2012, Ukrainian gas imports had fallen to 29.8 bcm (BP, 2013: 28). In H1 2013, Ukrainian imports of Russian gas were down to 9.67 bcm (a 39 percent year-on-year reduction) (Khrennikova, 2013), suggesting total imports of 18 bcm in 2013. This meant that in H1 2013 Ukraine had fallen to the fifth-largest importer of Russian gas, behind Germany, Italy, Turkey, and Belarus (Khrennikova, 2013; Prime-Tass, 2013). In January 2013, Royal Dutch Shell signed a production sharing agreement (PSA) for the Yuzivska shale gas field in Eastern Ukraine. In the medium term, the Ukrainian government hopes to diversify its gas imports by increasing the amount of gas the country imports from Europe. In May 2012, Naftogaz signed a gas supply agreement with RWE (Germany) for the supply of up to 5 bcm in 2013. Small volumes of imports from Poland began in November 2012, which were then augmented by supplies from Hungary from March 2013. Yet between January and November 2013, Ukraine imported just 1.9 bcm from Europe, significantly below the 7 bcm import capacity from Poland and Hungary (Interfax Energy, 2013). The operator of Ukraine’s GTS, Ukrtransgaz (a subsidiary of Naftogaz) also began talks with Slovakia’s pipeline operator, Eustream, about the possibility of reversing the flow of one of the pipelines that crosses the Slovak-Ukrainian border, giving a further 10 bcm of potential import capacity (Bor, 2013). In the long term, the Ukrainian government is pinning its hopes on the development of shale gas and offshore conventional gas production in Ukraine with the participation of international energy companies. In January 2013, Royal Dutch Shell signed a production sharing agreement (PSA) for the Yuzivska shale gas field in Eastern Ukraine. This was followed by Chevron signing a PSA for the Olesska field in Western Ukraine. The Ukrainian government also hopes to sign a PSA with ExxonMobil before the end of 2013 for the development of a conventional offshore gas field in the Black Sea. According to the Financial Times, “Eduard Stavytsky, the country’s energy minister, has said that if the two shale projects and offshore ExxonMobil project worked out as hoped, they could together produce 20 bcm annually within 10 years. That would double current production and potentially enable Ukrainian production to completely meet its gradually falling domestic demand” (Buckley, 2013). As the winter heating season began in October 2013, the stage was set: Gazprom was diversifying its export routes away from Ukraine, and the Ukrainian government was working to reduce Ukraine’s dependence on Russian gas imports. The question was, would this lead to a calming of the previously turbulent Russian-Ukrainian gas relationship? Observers did not have to wait long for their answer. At the end of October, Russian television broadcast a meeting between the Chief Executive of Gazprom, Alexei Miller, and the Russian Prime Minister, Dmitrii Medvedev. In that meeting, Miller complained that Naftogaz had failed to pay a bill of $882m for its August gas imports, and suggested that, in the terms of the existing Gazprom-Naftogaz gas supply contract, Naftogaz should now face the penalty of switching to a schedule of pre-payments (RIA Novosti, 2013a). Naftogaz responded by suspending its imports of Russian gas for several days between the 9th and 15th of November (Ukrinform, 2013a), prompting fears that Naftogaz was using up gas from its storage, which would later be needed to ensure uninterrupted gas transit during the depths of winter (Interfax Ukraine, 2013a). Protests in Kiev, December 2013. Source: http://news.kievukraine.info. Ukrainian Prime Minister Azarov requested 20bn Euros in financial aid in return for signing the Association Agreement to help restructure the Ukrainian economy. Then, at the end of November, the Ukrainian President, Viktor Yanukovych, failed to formally sign Ukraine’s Association Agreement with the European Union at the EU Eastern Partnership Summit in Vilnius. This move triggered speculation that the Ukrainian government had been under political and economic pressure from Russia not to sign the agreement, which would have closed off any possibility of Ukraine joining the Customs Union. One component of such ‘economic pressure’ would certainly have been a combination of Ukraine’s dependence on Russian gas imports, Naftogaz’s outstanding debts to Gazprom, and Ukraine’s currently parlous economic situation. President Yanukovych has claimed that Ukraine needs $20bn a year until 2017 from the EU to modernise Ukraine’s economy and reorient it towards Europe, whilst referring to the EU offer of 610m Euros in macro-financial assistance ‘humiliating’. Meanwhile, Ukraine’s Prime Minister, Mykola Azarov, requested 20bn Euros in financial aid in return for signing the Association Agreement, to help restructure the Ukrainian economy (Zinets, 2013). 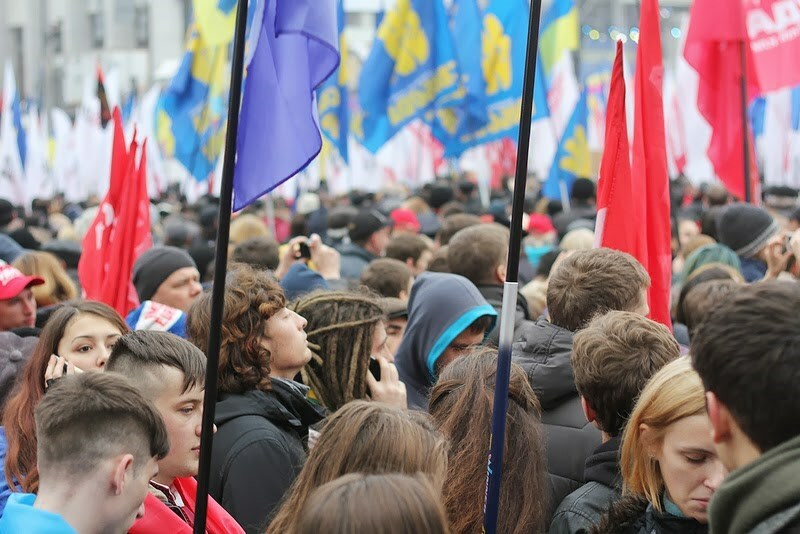 Yanukovych’s failure to sign the Association Agreement, and rumours of Ukrainian accession to the Russian-led Customs Union instead, also prompted massive public protests in Kiev that remain ongoing as of the 11th of December. There remains the possibility that, under the threat of ‘losing’ Ukraine to the EU, Russia could yet offer gas price discounts and debt restructuring without demanding that Ukraine join the Customs Union, which would surely trigger further protests and bring further pressure to bear on Yanukovych and his government. Even if South Stream is built at only half capacity (31.5 bcm) and Nord Stream can only operate at two-thirds capacity (37.5 bcm), the Russian need for gas transit via Ukraine will not amount to much more than 25 bcm per year. Several days after Yanukovych failed to sign the Association Agreement with the EU, reports emerged that Ukrainian officials had also failed to attend the signing of an agreement for the import of gas to Ukraine from Slovakia, scheduled for the 5th of November (Norman, 2013). However, this was subsequently denied by Ukrtransgaz (Ukrinform, 2013b), while the Ukrainian Energy and Coal Industry Minister, Eduard Stavytsky, told reporters in Beijing on the 5th of December that “We plan to [sign it] when we get back, next week” (Interfax Ukraine, 2013b). Yet by the 11th of December, the agreement had still not been signed. Also on the 5th of December, Gazprom’s Chief Executive, Alexei Miller, made an official statement contradicting claims made by Naftogaz 24 hours earlier that a deal had been reached on the payment of Naftogaz’s outstanding debts to Gazprom. Miller confirmed that Naftogaz now owed Gazprom $2bn in unpaid gas bills for August, October and November. Although the Chief Executive of Naftogaz, Yevhen Bakulin, had acknowledged the debt and claimed that an agreement had been reached for Naftogaz to wait until the New Year to settle its debts for gas imported between October and December, Miller announced that while talks remained ongoing, nothing had yet been agreed (RIA Novosti, 2013b). Therefore, although Gazprom and Naftogaz have a supply and transit contract that will take them through the winter period (unlike in the winters of 2005-06 and 2008-09), the major issues of Naftogaz’s debt to Gazprom and the amount of gas that Naftogaz holds in storage will ensure that this winter remains a nervous one for European states dependent on Russian gas supplies and Ukrainian gas transit. Over the five years since the January 2009 Russia-Ukraine gas dispute, both sides have worked to reduce their dependence on one another. With EU demand for Russian gas relatively stagnant, it is not expected that Russia will export much more than 150 bcm per year to the EU for at least the medium term. Thanks to the construction of Nord Stream, Gazprom currently has access to 105-110 bcm of capacity for exporting gas to the EU, plus 142 bcm via Ukraine (Naftogaz, 2013). Nord Stream is currently operating at approximately half capacity, having delivered 21 bcm between January and November 2013, while regulatory difficulties in Germany are currently limiting Nord Stream’s capacity to 37.5 bcm (Reuters, 2013). Even if South Stream is built at only half capacity (31.5 bcm) and Nord Stream can only operate at two-thirds capacity (37.5 bcm), the Russian need for gas transit via Ukraine will not amount to much more than 25 bcm per year. For comparison, the transit of Russian gas to Europe via Ukraine amounted to 70 bcm in January-October 2013 and is expected to reach approximately 85 bcm for the whole of 2013 (Interfax Ukraine, 2013c). In light of Ukraine’s current financial difficulties, the loss of transit revenue due to declining transit volumes would represent a painful blow to an already fragile Ukrainian economy. …It is quite possible for Gazprom to offer gas more cheaply to Ukraine than European suppliers operating on the basis of European spot prices. From the Ukrainian perspective, if Ukrainian gas demand stabilises at around 50-55 bcm, much will depend on the volume of imports from Europe and domestic production increases. However, European imports are not expected to exceed 10 bcm for the foreseeable future, while current domestic production would need to increase from 20 bcm to 40 bcm to entirely displace Russian gas imports. A more likely scenario is the limited development of shale and offshore gas production, perhaps to 10 bcm, and a reduction of Russian gas imports to around 15 bcm by 2018. However, the costs of developing new gas production is unlikely to render shale gas and offshore gas production significantly cheaper over the next five years. Furthermore, Russian gas prices on the German border over the first ten months of 2013 ($11.27) began to converge with spot prices at the UK National Balancing Point (NBP) ($10.33) (Shiryaevskaya, 2013). If the ‘netback’ reduced costs of transportation, and Ukraine’s $100 discount agreed in Kharkiv in April 2010 are taken into account, it is quite possible for Gazprom to offer gas more cheaply to Ukraine than European suppliers operating on the basis of European spot prices. For Ukraine in 2018, diversified gas supplies may be more secure, but they won’t necessarily be significantly cheaper. By the end of 2018, it is entirely possible that Russia and Ukraine will have significantly reduced their mutual gas dependency. Ukrainian transit may account for around 17 percent of Russia’s gas exports to the EU, while Russian gas supplies may account for 27 percent of Ukrainian gas consumption – a sizable reduction from figures of 81 percent and 78 percent respectively in 2008. Late 2018 could also see negotiations for the renewal of the Gazprom-Naftogaz gas supply and transit contract, which is due to expire in January 2019. It will be during these negotiations that the effects of reduced interdependency will become clear: Will such reduced interdependency be sufficient to break the cycle of mutual recriminations over the price charged for gas by Gazprom to Naftogaz and the repeated accumulation of debts to Gazprom by Naftogaz? Only if it is accompanied by a more transparent contractual and pricing system, and increased payment discipline by Ukrainian gas consumers that purchase their gas from Naftogaz, which would give Naftogaz the ability to meet its payment commitments to Gazprom. Furthermore, these commercial conditions will undoubtedly be influenced by the future decisions of the Ukrainian government regarding integration with its two most important neighbours, Russia and the EU. Dr. Jack D. Sharples is a lecturer in energy politics at European University at St. Petersburg. Bor, A., 2013. Ukraine to boost natural gas imports from Poland Apr 1: Ukrtransgaz. Platts, 29 March. Available at: <http://www.platts.com/latest-news/natural-gas/kiev/ukraine-to-boost-natural-gas-imports-from-poland-21887663> [Accessed 09 December 2013]. BP, 2009. Statistical review of world energy 2009. [pdf] Available at: <http://www.bp.com/liveassets/ bp_internet/globalbp/globalbp_uk_english/ reports_and_publications/ statistical_energy_review_2008/STAGING/ local_assets/2009_downloads/statistical_review_of_world_energy_full_report_2009.pdf> [Accessed 09 December 2013]. BP, 2010. Statistical review of world energy 2010. [pdf] Available at: <http://www.bp.com/liveassets/ bp_internet/globalbp/globalbp_uk_english/ reports_and_publications/statistical_energy_review_2008/STAGING/ local_assets/2010_downloads/statistical_review_of_world_energy_full_report_2010.pdf> [Accessed 09 December 2013]. BP, 2011. Statistical review of world energy 2011. [pdf] Available at: <http://www.bp.com/liveassets/ bp_internet/globalbp/globalbp_uk_english/ reports_and_publications/ statistical_energy_review_2011/STAGING/ local_assets/pdf/statistical_review_of_world_energy_full_report_2011.pdf> [Accessed 09 December 2013]. BP, 2012. Statistical review of world energy 2012. [pdf] Available at: <http://www.bp.com/assets/ bp_internet/globalbp/globalbp_uk_english/ reports_and_publications/ statistical_energy_review_2011/STAGING/ local_assets/pdf/statistical_review_of_world_energy_full_report_2012.pdf> [Accessed 09 December 2013]. BP, 2013. Statistical review of world energy 2013. [pdf] Available at: <http://www.bp.com/assets/ bp_internet/globalbp/globalbp_uk_english/ reports_and_publications/ statistical_energy_review_2011/STAGING/ local_assets/pdf/statistical_review_of_world_energy_full_report_2012.pdf> [Accessed 09 December 2013]. Buckley, N., 2013. Ukraine’s shale gas lures western companies. Financial Times, 14 November. Available at: <http://www.ft.com/intl/cms/s/0/abe8802a-4d0c-11e3-9f40-00144feabdc0.html#axzz2n0MwOMuI>[Accessed 09 December 2013]. Energy Information Administration, 2013. Europe Brent spot prices FOB (Dollars a Barrel). [online] Available at: <http://www.eia.gov/dnav/pet/hist/ LeafHandler.ashx?n=pet&s=rbrte&f=m> [Accessed09 December 2013]. European Network of Transmission System Operators for Gas (ENTSOG), 2013. Gas transmission capacity map. [pdf] Available at: <http://www.entsog.eu/public/uploads/files/maps/transmissioncapacity/2013/ ENTSOG_130724_MAP_CAP-Transmission.pdf> [Accessed 09 December 2013]. European Union External Action Service, 2012. Information on the EU-Ukraine Association Agreement. European Union External Action Service News, 14 September. Available at: <http://eeas.europa.eu/ top_stories/2012/140912_ukraine_en.htm [Accessed 09 December 2013]. Eurostat, 2013. Energy production and imports. [online] Available at: <http://epp.eurostat.ec.europa.eu/ statistics_explained/index.php/ Energy_production_and_imports> [Accessed 09 December 2013]. Gazprom, 2013. Gazprom in figures: 2008-2012. 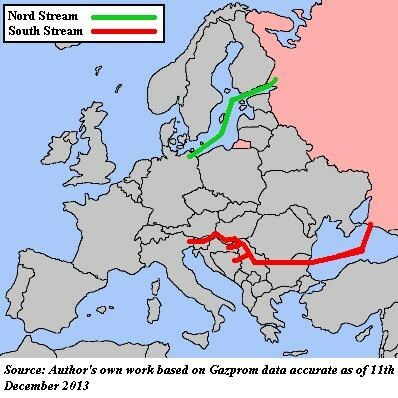 [pdf] Available at: <http://www.gazprom.com/f/ posts/01/207595/gazprom-reference-figures-2008-2012-eng.pdf> [Accessed 09 December 2013]. Interfax Energy, 2013. Ukraine imports almost 1.9 bcm of gas from Europe in Jan-Nov. Interfax Energy, 2 December. Available at: <http://interfaxenergy.com/natural-gas-news- analysis/russia -and-the-caspian/ ukraine-imports-almost-1-9-bcm-of-gas-from-europe-in-jan-nov/> [Accessed 09 December 2013]. Interfax Ukraine, 2013a. Gazprom alarmed over reliability of winter Ukrainian transit to EU. Interfax Ukraine, 14 November. Available at: <http://en.interfax.com.ua/news/economic/175025.html> [Accessed 10 December 2013]. Interfax Ukraine, 2013b. Ukraine plans to sign contract on gas supplies via Slovakia. Kiev Post, 5 December. Available at: <http://www.kyivpost.com/content/ukraine/ukraine-plans-next-week-to-sign-contract-on- gas-supplies-via-slovakia-333076.html> [Accessed 09 December 2013]. Interfax Ukraine, 2013c. Ukraine intends to retain Russian gas transit at no less than 90 bcm in 2014. Interfax Ukraine, 28 November. <http://en.interfax.com.ua/news/economic/177426.html> [Accessed 10 December 2013]. International Energy Agency, 2012. Natural gas information 2012. [pdf] Available at: <http://www.iea.org/media/training/presentations/statisticsmarch/NaturalGasInformation.pdf> [Accessed 09 December 2013]. Khrennikova, D., 2013. Russia’s Gazprom H1 gas exports to Europe up 9.6% on year to 78.9 bcm. Platts, 15 August. Available at: <http:// www.platts.com/latest-news/natural-gas/moscow/ russias-gazprom-h1-gas-exports-to-europe-up-96-26187212> [Accessed 09 December 2013]. Naftogaz, 2013. Types of activities: gas transportation. [online] Available at: <http://www.naftogaz.com/www/3/nakweben.nsf/0/3375A8575C8884D0C22571010035B9D2?OpenDocument&Expand=2&> [Accessed 09 December 2013]. Nord Stream AG, 2013. Pipeline: construction. [online] Available at: <http://www.nord- stream.com/pipeline/construction/> [Accessed 09 December 2013]. Norman, L., 2013. Ukraine officials fail to show to sign gas import deal. Wall Street Journal, 5 December. Available at: <http://online.wsj.com/news/ articles/ SB10001424052702304096104579240402194750682> [Accessed 09 December 2013]. Pirani, S., Stern, J., and Yafimava, K., 2009. The Russo-Ukrainian gas dispute: a comprehensive assessment. [pdf] Oxford Institute for Energy Studies. Available at: <http://www.oxfordenergy.org/2009/02/the- russo-ukrainian-gas-dispute-of-january-2009-a- comprehensive-assessment/> [Accessed 09 December 2013]. Prime-Tass, 2013. Belarus’ gas imports stable in H1 2013 at 10.4bn cubic metres. Export.by, 29 August. Available at: <http://export.by/en/? act=news&mode=view&id=50790> [Accessed 09 December 2013]. Radio Free Europe/Radio Liberty, 2010. Russian- Kazakh-Belarusian Customs Union comes into force. Radio Free Europe/Radio Liberty, 5th July. Available at: <http://www.rferl.org/content/Eurasian_Summit_Opens_In_Astana/2091161.html>[Accessed 09 December 2013]. Reuters, 2013. EU to set limit on Russian gas volumes for Germany’s OPAL in early 2014. Moscow Times, 8 December. Available at: <http://www.themoscowtimes.com/business/article/eu-to-set-limit-on-russian-gas-volumes-for-germanys-opal-in-early-2014/491066.html> [Accessed 10 December 2013]. RIA Novosti, 2013a. Russia to demand upfront payment from Ukraine for gas. RIA Novosti, 29 October. Available at: <http://en.ria.ru/ russia/20131029/184409393.html> [Accessed 09 December 2013]. RIA Novosti, 2013b. Ukraine owes Russia $2bln over gas, no deferral deals yet – Gazprom. RIA Novosti, 5 December. Available at: <http://en.ria.ru/ business/20131205/185262063/Ukraine-Owes-Russia- 2Bln-Over-Gas-No-Deferral-Deals-Yet–Gazprom.html> [Accessed 09 December 2013]. Shiryaevskaya, A., 2013. Putin frees Russian gas chilled amid permafrost: energy markets. Bloomberg, [online] 6 December. Available at: <http://www.bloomberg.com/news/2013-12-06/putin-frees-russian-gas-chilled-amid-permafrost-energy-markets.html> [Accessed 11 December 2013]. South Stream Transport AG, 2013. News: 2012. [online] Available at: <http://www.south-stream.info/ en/press/news/archive/2012/> [Accessed 09 December 2013]. Ukrinform, 2013a. Ukraine resumes purchases of Gazprom’s gas, Miller confirms. Ukrinform, 15 November. Available at: <http://www.ukrinform.ua/eng/ news/ukraine_resumes_purchase_of_gazproms_gas_miller_confirms_312947> [Accessed 10 December 2013]. Ukrinform, 2013b. Ukrtransgaz denies failure of signing agreement with Slovakia on gas supplies. Ukrinform, 7 December. Available at: <http:// www.ukrinform.ua/eng/news/ukrtransgas_denies_failure_of_signing_agreement_with_slovakia_on_supply_of_reverse_gas_314398> [Accessed 09 December 2013].